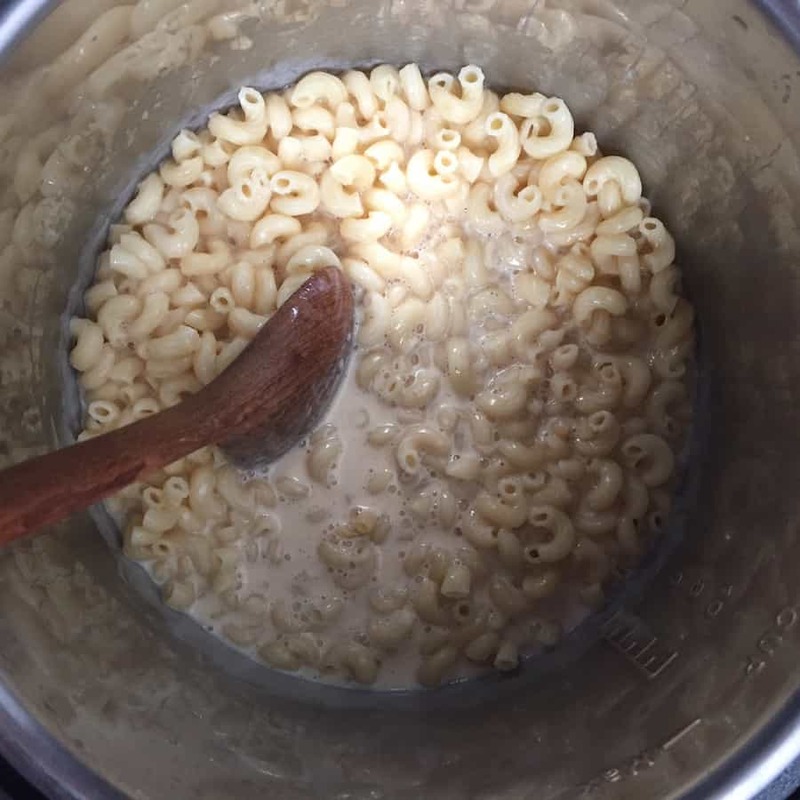 Mac and Cheese from a pressure cooker? Yes! If I’m going to make homemade mac and cheese, it must be good. After all, this dish is really rich. I don’t want to waste those ingredients or calories on something so-so. 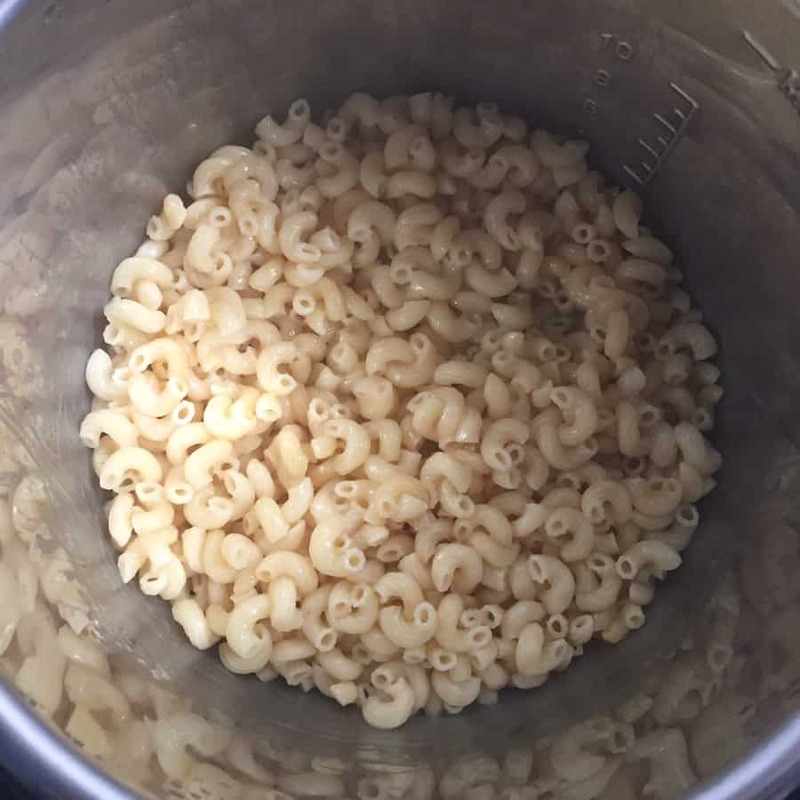 As much as I love my Instant Pot, I wasn’t sure if I wanted to make mac and cheese in it. But a recipe caught my eye and I thought something like, “Eh. What the heck?”← that’s the way all good life decisions start, right? After one taste, seriously, one taste. I was hooked. 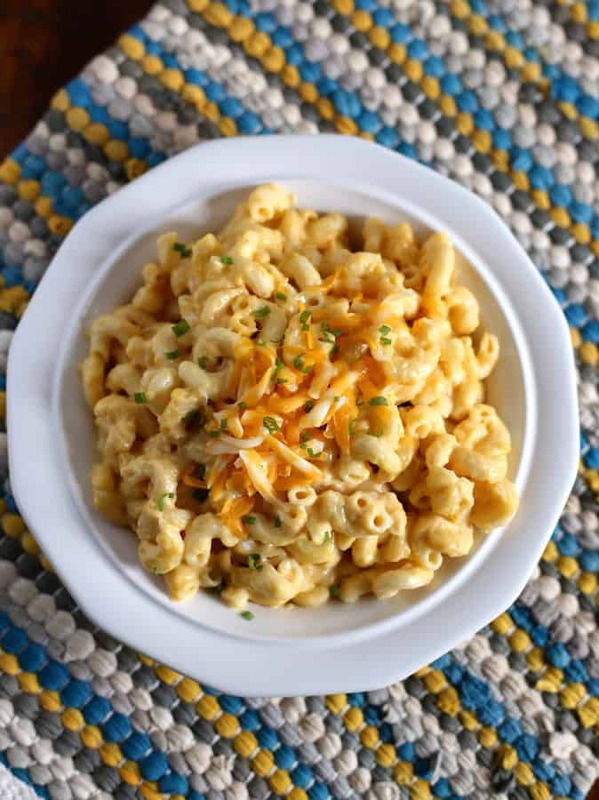 Over time, I tinkered with the recipe so that it came out they way I like mac and cheese: really creamy and flavorful. This recipe, unlike traditional stovetop mac and cheese, doesn’t require a separate cheese sauce. You simply cook the pasta under pressure, add the milk, an egg (the egg is optional but suggested), and cheese. A little mustard and hot pepper sauce are added for flavor and you’re done. Mac and Cheese in minutes. Woo-HOO! Some people make their mac and cheese with shells. Others make it with penne. Some reach for ziti. I’m firmly in the elbow macaroni camp. Not only do I love the way this shape hugs the cheese sauce, it also cooks perfectly in a pressure cooker without coming out crunchy or, even worse, gummy. 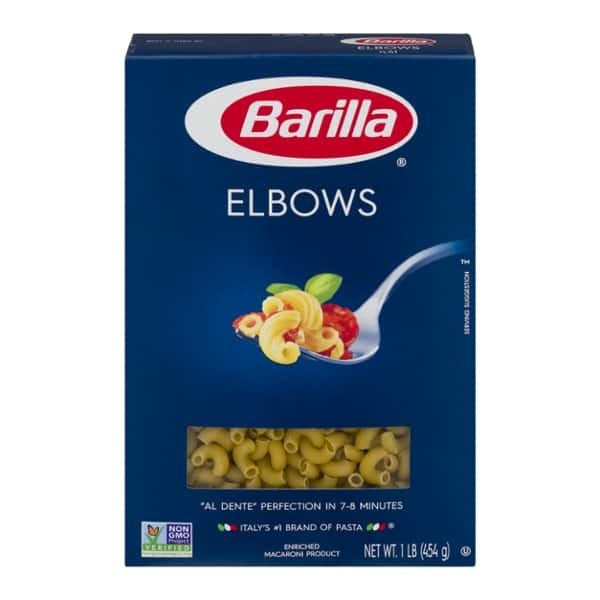 If you follow a gluten-free diet, use Barilla elbow pasta. It cooks nicely and reheats really well without getting weird and crunchy. The inspiration for this recipe came from the Cook’s Illustrated’s Pressure Cooking Perfection cookbook. (affiliate link) That recipe uses evaporated milk. I really, REALLY wanted to redo the recipe and make it without evaporated milk. For some reason, I found this ingredient to be a pain. I rarely keep evaporated milk in the house. I tried the recipe with whole milk. I tried it with half and half. I tried it with a mix of both. (And I went to the gym a LOT). None of those ingredients worked as well as the can of evaporated milk. The recipe made with whole milk wasn’t quite creamy enough. All half and half made it too rich. The combination of whole milk and half and half was actually pretty good. But having to have both whole milk and half and half was more of a bother than a can of evaporated milk. So evap milk it is! 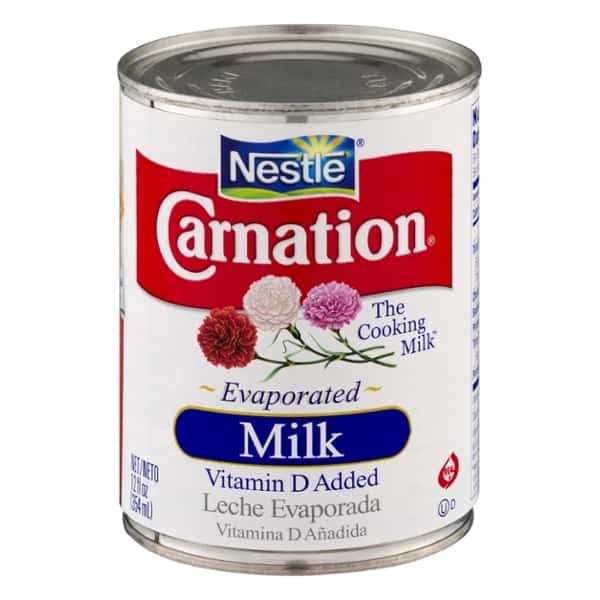 Be sure to use regular evaporated milk and not the light or low-fat version. A bowl of macaroni and cheese must be a rich creamy affair. To achieve this texture, I’ve always used an egg. This recipe is no exception. It adds a custard-like note to the cheese sauce without making it eggy. If you’re allergic to eggs, skip it. If not, I encourage you to add the egg. It takes the recipe from excellent to heavenly. There’s always some disagreement on what type of cheese makes the best mac and cheese. I like a combination of Cheddar and Colby-Jack. 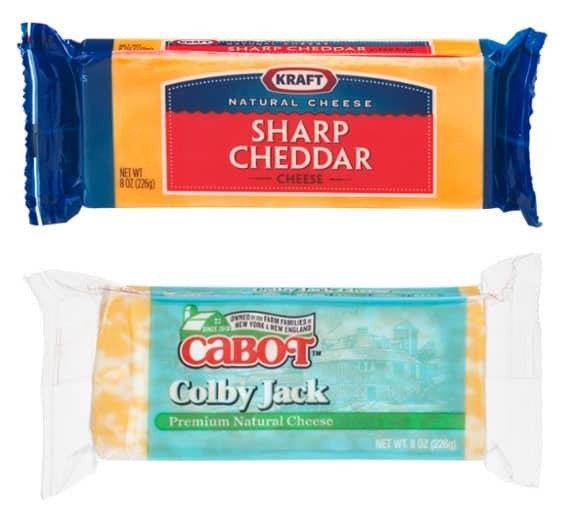 The Cheddar brings the flavor and sharpness, while the Colby-Jack brings a delicate creaminess. For me, no other combination tastes as good. And this is one time to skip the extra sharp or aged Cheddar cheeses. They won’t melt as well in a quick recipe like this one. If you have the time, I recommend grating your own cheese. Pre-shredded cheese is coated with cellulose to prevent it from clumping. This tends to dry out the cheese and, in my opinion, doesn’t make for as creamy a mac and cheese. The pasta is the only ingredient that gets cooked under pressure. To cook, combine the pasta with water, salt, and butter. Yes, butter. Not only does the butter add richness to the noodles, it also prevents foam from forming as the pasta cooks. After the cooking cycle completes, the pasta needs to rest in the pressure cooker for one minute before releasing the pressure. If you use an Instant Pot like I do, the keep warm cycle kicks on and the display will read L00:01. Don’t go wandering around during this minute. If the pasta sits for longer than that, it can overcook. Be sure to stir during this process or the milk mixture can get curdled and clumpy. As soon as the mixture thickens, start adding the cheese. If you cook the milk too long, it can overcook and get too thick. 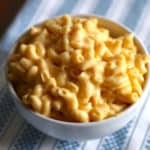 Traditional macaroni and cheese recipes usually start with a cheese sauce made with a roux (a cooked mixture of butter and flour). After cooking the roux, you add the cheese slowly to prevent it from breaking and turning oily. This recipe doesn’t use a cheese sauce but you do want to add the cheese slowly. If you were to dump eight ounces of cheese in at one time, the temperature of the pasta would drop quickly and the cheese would only sort of melt. “Sort of” melted cheese gets clumpy. It’s easy to avoid this! Just add about 1/3 of the grated cheese at a time. Stir gently until it melts about 90% and then repeat with another 1/3. Repeat this until you’ve added all the cheese. And then? Done! 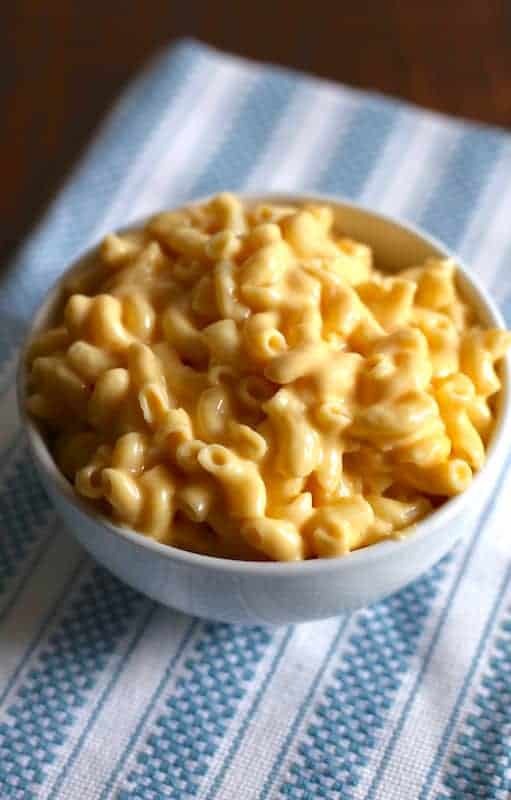 Once the macaroni and cheese looks creamy, immediately transfer it to a serving dish. The pot of the pressure cooker, even when removed from the unit, holds too much heat and can cause the cheese sauce to overcook. Add Scallions: A few snipped scallions, either the root end or the green top, add a nice onion-y zip. You can either stir into the finished mac and cheese or sprinkle on top. Add Bacon: The most over-the-top addition: crispy bacon. For me, it has to be a good smokey bacon. 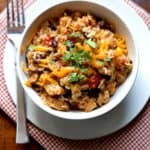 Combine with Chili: My husband likes to combine mac and cheese with veggie chili. The combination works surprisingly well. A blend of Cheddar and Colby-Jack makes for a creamy mac and cheese. Combine water and salt in the pot of an electric pressure cooker. Stir to dissolve the salt. Add the pasta and butter. Lock lid in place. Set a 4 minute cook time on high pressure. While the pasta cooks, whisk together evaporated milk, egg, mustard, and hot pepper sauce in a small bowl. Once cook cycle completes, allow pasta to sit for one minute. After one minute, open the machine using a quick pressure release. If it isn't already, turn on the "keep warm" setting. Pour the milk mixture over the pasta. Stir until it thickens, about two minutes. Add 1/3 of the cheese. Stir the macaroni until the cheese melts. Repeat, adding 1/3 of the cheese at a time, until all the cheese had been added. 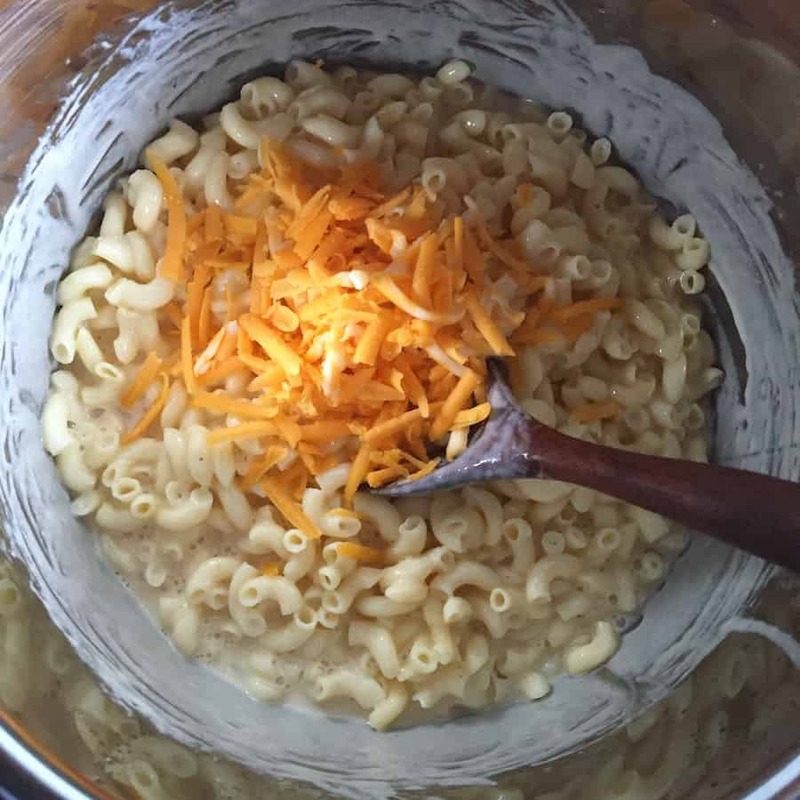 Once the cheese has melted, remove the pot from the pressure cooker and immediately pour the macaroni and cheese into a serving dish. If the pasta stays in the cooking pot, it can overcook and turn curdled and lumpy. Season to taste with salt and pepper. Serve immediately. Store leftovers in the refrigerator for up to three days. Reheat, covered, in a microwave. Be sure to turn pressure cooker to the "keep warm" setting when adding the milk, egg, and cheese. As soon as the milk mixture thickens, begin adding the cheese. Add the cheese in three additions. Stir and allow the cheese to melt before adding the next handful. As soon as all the cheese melts, pour the mac and cheese into a serving dish to prevent it from overcooking. I love mac and cheese! Gotta bust out the pressure cooker. We loved this—delicious and easy. Made a nice salad while the noodles cooked, and voila. Perfect quick and yummy dinner. Thanks as always! It’s terrific, my first Instant Pot mac n cheese! Thank you for all the information! 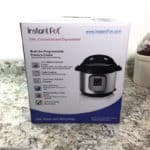 I just got my Instant Pot today. In reading the directions it says not to cook any pasta, even macaroni, because it can foam, froth and sputter and clog the preasure release device. Have you noticed this to be an issue? Yes. That’s totally true. I’ve not experienced an issue. Just be sure not overfill the pot and always use butter or oil while cooking the pasta to keep the foam down. It was great and fast ! Thanks ! And it was so good . Thanks for letting me know! I haven’t tried that brand yet. Barilla does make a gluten-free elbow pasta, but the box pictured is not gluten-free. If you need gluten-free, be sure to get the correct variety of pasta–it shows “Gluten-Free” on the box, just below the Barilla label. Followed recipe exactly. Looking at watery cheesy something with macaroni. Not happy. Hmm…I’ve never had that happen. What type of pasta did you use? It usually looks thin when you first add the evaporated milk. Then during the two minute cook, it thickens. Did it thicken during this step? Elbows. And it never thickened. It’s like a soup — and a very bland soup at that. 🙁 So bummed! This happened to me too. Except it is delicious soup. The flavor really depends on the cheese you use. For me the sharper the better. I think where I went wrong was my macaroni noodles were a very large variety. Had I used two cups of the regular type I’m sure it would have been perfect. It’s actually the first Mac and cheese I’ve made that did break. I should have drained the water left in the pot after cooking the noodles I think. Yes. For pressure cooker recipes, the style of pasta really matters. If you used large noodles they would not have cooked or absorbed the water the same way. I made this again tonight with normal sized elbows. It is perfect!!! I accidentally got Fat Free evap milk once and the same thing happened…could this possibly be the culprit? Sorry for chiming in, I just remember how gross mine was! Sometimes the labels look identical! Needless to say, I’m EXTRA careful when I look at the cans now, LOL. Ooooh! Very interesting! Thanks for chiming in. I have one huge problem with this recipe! It says 6 servings!?! More like 1! Although….it might have just tasted that good. Great recipe all around. I used about 12 ounces of cheese (6 and 6). Mine didn’t look like it was thick before the cheese was added but I just went with it and OMG is this stuff amazing! For spice I added siracha’s garlic hot sauce and it was a great add! I used about half a table spoon. Also, I hate mustard on principle so I didn’t add it and it turned out great. Can’t wait to add the green onions and bacon for the next batch! Friggin A!! So quick and easy!! The hardest part was shredding the cheese! Definitely a keeper! Thank you Elizabeth!